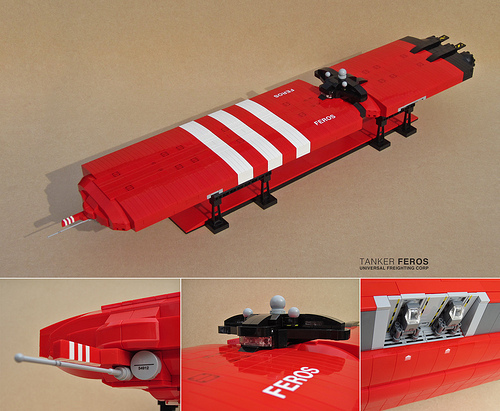 I never thought I’d see a space ship with a slim waist, but the Feros by Stijn (Red Spacecat) is just that. This thing is all smooth curves, synched in by a belt (in this case the bridge) in the center. He’s scattered a few interesting details throughout, which stand out starkly against the otherwise smooth figure. As always, Stijn goes the extra mile in photoshop to bring us a nice presentation, as well. Those shuttles are inspired, especially the stud gaps.